The two children I’m with have been excited for weeks, and I’d say Derek Landy is as welcome as Father Christmas, judging by how they jump. I’ve borrowed two very big fans of Derek’s for this meeting, to lighten things up a bit. Charlie liked Derek’s new book so much that he wrote two reviews of it for the local bookshop’s review page. Various transport issues means Derek is late, and Phoebe and Charlie can barely contain themselves when he finally turns up. The delay means we have to let Derek sign books for the customers in the shop first, before we interview him. But they are happy to simply stand next to him and chat. 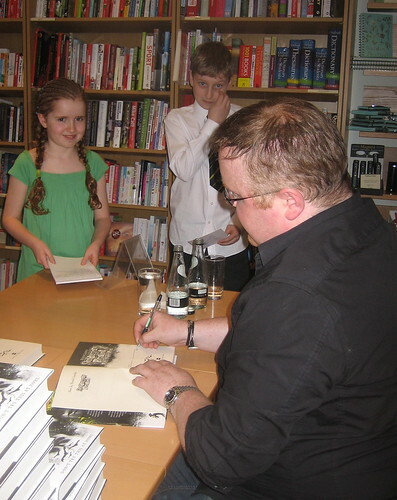 Derek came last year when his first book about the dead detective Skulduggery Pleasant was published, so he has a wide fan base locally, and judging by the length of the queue they have all turned out to see him again. I’d say Derek has got more used to this role over the last twelve months, and this time he is accompanied by only one helper, Sam. “I’m not so keen on that”, says Derek to Sam, as he sees the books ordered by someone who wants to sell them, with special requests on how they should be signed. The books get left on the side. He gets on with talking to the young buyers who have turned up in person, asking what their names are and finding out what kind of face they would like with the signature. Derek does a cartoon face of himself for each book, and he has a range of happy and sad and scary and angry, and many more. While Sam admires Phoebe’s intricately plaited hair, a souvenir from Dubai, Phoebe stands next to Derek and helps with the choice of faces. “Happy face” she whispers, and Derek agrees that “sometimes you just know” what it should be. Charlie gets carried away with all the books around him, and decides to buy some more, just for the fun of it. “You’re going to get more awkward as you go on, aren’t you?” Derek says. “This is going to be good”, about the cartoon he has in mind. Then, for good measure, he makes engine noises. Boys will be boys, even at the age of 34. He says no thanks to the offer of cake, however, and I try and decide if Derek has lost weight. He’s wearing his signature black shirt and black trousers, which looks just right, in- between formal and informal. Derek remembers names despite being introduced to so many in a short period of time. “Charlie, are you here again?”, as Charlie is back for more. Derek decides to sign the ebay-bound books after all. ”I don’t mind people selling on ebay, as long as it’s not a whole box”. He’s been requested to write the first line, and says he should learn to start all books with a short word like “Pow”, from now on, to cut down on what has to be copied out. Phoebe tells him to do sad faces for the ebay books, but he explains they get no faces at all. They are laughing as they wonder if Derek could put in a little threat in his books like “if you buy this book on ebay, a little angel will die”. More laughing. Phoebe wants to know how they made the edges of the paperback glow-in-the-dark, “really cool”, so Derek explains how when they are not busy, the PR staff get put in the basement to colour in the edges with special markers. Very funny. He asks “who’s your favourite author, apart from me, obviously?” Always nice with a man who believes in himself. Derek can multi-task, so we start the interviewing once he gets going on signing the huge piles of books waiting, which just require a signature. 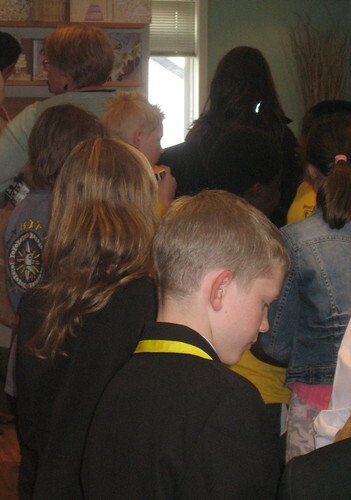 Accompanied by the sound of books piling up, Charlie and Phoebe decide how they will divide up the questioning. “I’ve always been writing, since I was eight or nine. I kept on writing when I was a teenager, and got expelled from college. After, I worked on the family farm for six years, writing scripts, for films. 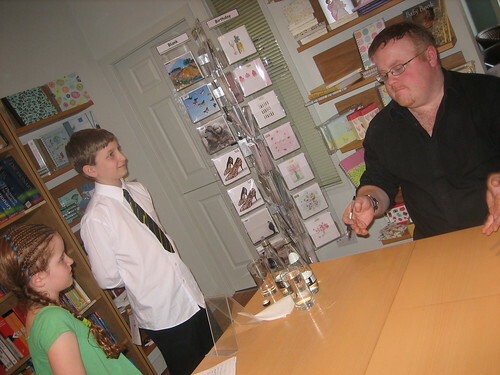 Then with Skulduggery Pleasant, writing books. “Nothing. I lead a very boring life. I write books, I walk my dog, I buy my toys. That’s pretty much it.” Shocked giggles from Charlie and Phoebe. Phoebe and others promise to talk to Derek. “Chuck, this has been a lot of fun.” He shakes everybody’s hands before Sam drags him away. This is cool Ann, thanks for posting it! Very nice interview, Bookwitch! And interesting to a Skullduggery novice like me. Reading the book for the Lancashire book award and this makes it much more personal, esp. with the photos. That is so cool,you got to interveiw Derek Landy. I hope all of the books will be as good as the first two. I really want to go for an audition so………..if any 1 has any info PLEASE!!!!! Let me know!!! I already can’t wait for the second book so I’m glad he’s making a long series. As Derek says, try the Bebo page for Skulduggery. Does anyone know when and if the Stephanie Auditions are coming to Manchester in England? I am dyeing to know because I really love Stephanie. She’s like my role model!!! i love the skullduggery pleasant books i am a quater way through the 3rd book and i am loving it, it is one of my favourite series. i cant wait untill the 4th book, i cant believe there are going to be 9 BOOKS, i am soooooooooooo happy. plese let me know if anybody finds out when the 4th book comes out. The first book is really cool, i loved it so much i finished it in 2 hours besides the point i’m only 11. I’m really anoyed because I can’t find the other book anywhere in any shop I go in! It is the best book i’ve read for a long time. I think it is really funny in the first book where he curses under his breath constantly. Please tell me about the auditions when they come because I would LOVE to audition for it. I just got the third book and I’m so stuck into it! Derek has an amazing sense of humor. His style of writing is so original; I love it! The 3rd book was the best, I literally couldn’t put it down all day. I can’t believe we have to wait a whole year until the next book though! I don’t like waiting… can’t wait if there’s a movie either! Valkyrie is actually like my role model! I love the dedications in all the Skulduggery Pleasant books, and yeah, Derek does seem to have a really good sense of humor. I’m doing my school project on him, mostly, because it’s about people. Do you know when the film is coming out, I heard some time next year, but I so want to audition for the part of Tanith Low! I love the books. I’ve almoat finished the second book. i got it yesterday 🙂 mum isn’t particularly pleased though. I really want to go to the auditions so if anyone knows anything please email me. I think the books are amazing!! i have read the first book three times as well as he second one but i haven’t got the third book yet waaaa!! I’m only 12 and i haven’t finished a book so many times before. the fourth book is coming soon. heya i finished all the skulduggery books in 2 days so i am sooooo excited to hear about the movie. cause im in australia i cant really get info that easily but (thanks to an inside sorce) i know that the only open auditions will be 4 val and the derek is hoping to get johny depp to play skul though he is considering david tennant. please reply if anyone hears ANYTHING about the val auditions. im 12 so i can still audition even though im in australia….plz help!!! What a treat…for me I mean. is there going to be a film? So, not what you all want to hear, but at least it’s information of sorts. Hi I LOVE skullduggery it’s the best book ev!!!!!!!!!!!!!!!!!!!!!!!!!!!!!!!!!! I can’t wait for Dark days!!!! I LOVE U VALKYRIE CAIN UR MY ONE AND ONLY ROLE MODEL YOU INSPIRED ME TO FIND OUT WHO I AM AND WHETHER THERE REALLY IS MAGIC I HOPE SO BUT I DOUBT IT DOES. i don’t think anyone knows where the auditions are and when. i do want to audition though. i look just like how he described her. dark hair, dark eyes and im 12. I really want to audition for the part of Stephanie/Valkyrie.I’ve read all the books and Valkyrie is kind of like me.So i think i will be a good Valkyrie cain/Stephanie. I would love to be valkyrie because it sounds like we are very alike. In the first book it says she diddnt get on with many people in her class cause she diddnt have ewt in common with them, well thats the same as me! All the time i wish that i coul live Valkyries life if it was real but getting the role of her in a skulduggery pleasent film is as close as i can get so can u please contact me and tell me where and when the auditons are being held. It also sounds like i look like her too, i have dark hair and i am 12 years old. The only thing i dont have is dark eyes, my eyes are blue, but i hope that wont matter much. So please please PLEASE contact me and let me know where and when the auditions are being held. Thanks for reading this and see ya. I love the books, im Irish. live in the UK down near London. I’ve got dark brown hair till my elbows and dark blue eyes and have recently had a sun tan when I went Turkey for my holiday in jabuary. it was my birthday present, 12/01/1995. So, i am also writing a book. i know i’m 15, but guess what i am lucky enaugh to get it through. i had feedback, i like that. it gives me more ideas. So, the book is called: Jack Slay. not out yet, near december. Merging, Mitrust, Libya, December, Fissure, Kate, Preanaline, Sull, Vervain, Marie, Edward, Kyle, Shannon all sound weird? the’yre all the good guys. Edward is Armour and Shannons dad. he dies because he faced the bad guy: Torture Rapp Dark. anyone got good advise? Derek LANDY COULD YOU VISIUT UK IN NOTTINGHAM because i really want yuou to teach me dialogue and information on book writing. It woudl be great if you relplied to me. and by the way my name is: VALERIE JABAR. how did u find that out tiffany? i have just ead your books and i am currently reading `Dark Days’. 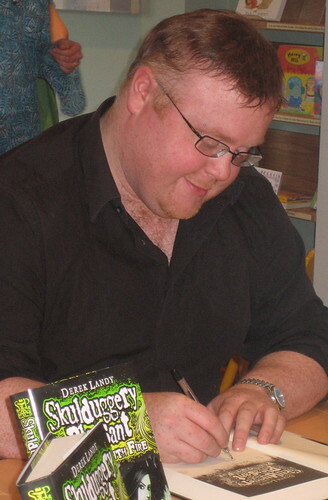 Derek Landy, to me, is the best writer ever. I absolutely love his work. I want him to carry on writing and making even more Skulduggery pleasent books. Good luck! i forgot to mention, I would like to audition is there is a Skulduggery Pleasant. I am only 12, my birthday, 2/6/1998, but there MUST be some part I coyld play. Once again, Derek Landy Rules! 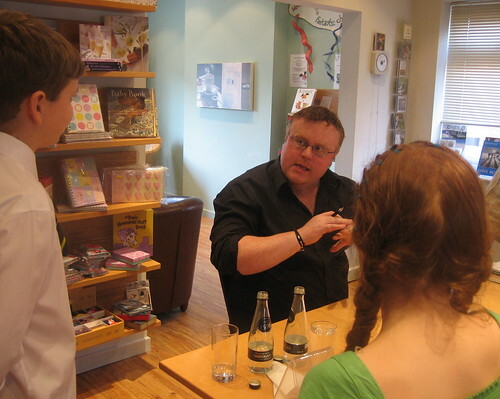 how do ya talk 2 derek landy? Skulduggery Pleasant is the best book ever. I have just started the 4th book it rocks!!!!! I really like Tanith low and Dusk. I also think Skulduggery Pleasant is really cool. Is there gonna be a movie??? I live in Australia so i dont know much! Please tell me if there is gonna beadition cause i so badly want ot be stephanie (valkyrie). I am 12 so i tihnk i am eligible! Please tell me when where aSAP!!!!!!!! I love these books and can’t wait for sept 2nd for mortal coil to be out!!!!! I really DON’T want a movie to be made though because that would totally wreck it for me……. I love Irish (native to me) authors because their style is kind of Irish. “Plenty of grands” that describes most Irish people’s speech patterns. Do you by any chance have a serious surplus of !!!! in Ireland? Mine are beginning to dry up after ‘meeting’ you. ; ) But that’s grand, too. are there ever going to be any auditions, ive read most of the books and there all absolutely BBBBBBBRRRRRIIIILLLLLLLLLLLIIIIAAAANNNNTTTT!!!! Please read my comments from 18th March and 4th August (they are both the same, btw). I love the skul-dug books!!! and even though the movie might ruin the picture i imagined in my head while reading the book, I still want it to be a movie, so that poeple who don’t like to read know about valkyrie and skulduggery and the rest of them! i just finished the 5th book…when is the next one out? I read skulduggery pleasant in 2007 when it first came out and fell in love with it. I told my friends to read it and they though it’d be crap, but I shoved it in their faces and ordered them to read…and guess what? They ab-so-lute-ly loooove the books now, so thank me for getting like 17 knew skulduggery pleasant book lovers. Any way, besides that, I’m stephanie, I love the fact that VALKYRIE and I have the same given name, but my last names Martinez…anyway, I’m 14 and I’m writing my Own book, pretty young – aye? well Im going to publish it when I’m older. I just read the 5th book and seriously! I cannot believe the vilest of vile is BACK! – what was the point of abbreviating it if I was gonna write it in full??? Beats me, anyway just want to express how much I LOATHE detective davina marr…eugh…makes me shudder and retch just thinking about that teeny nose! Hey annii, I know it’s unlikely that any of us will get the part but we could do very fine without those comments. You have your oppinion and I respect that but could you please for craps of sake try not to ruin my self-confidence??? Derek mentions the film, but not in the way you’d want him to. why did u spoil it i knew she was darkquess frm dark days but why ???? I no!! U totally ruined it for me!!!! she did say ”SPOILERS BELOW” so leave her alone. HOW COULD YOU TELL US THAT!!!!!!!! ESPECIALLY WITHOUT PUTTING A MAJOR SPOILER WARNING ON THE TOP!!!!!!!!!!!! I V-MAD BY THE WAY!!!!!!!!!!!!!!!!!!!! I agree Me!!! !, and I was about to remove it when I realised that enough people like yourself will already have seen it. And to be frank, I don’t think you should put to much store by what ‘Valkyrie’ says. Some of it is not really news if you’ve read the latest book, and we all have theories about what will happen, so in a way we may already have travelled a certain route in our minds. ‘Valkyrie’s’ email address doesn’t suggest that Valkyrie is part of her name. Draw your own conclusions. The 6st book is out in march and the 7th book is coming out in Sept 2012!!!!!! The 6th book has been out since September 2011. Heavens, I hope Mr. Landy reads these comments, you know, because I have the most brilliant, perfect idea. If there is going to be a movie, the characters must be portrayed accurately, yes? Now, I know everyone wishes to play Stephanie and so on and so forth. However, the one man who can do Skulduggery Pleasant justice in films is… JOHNNY DEPP. Believe me, he would be awesome, especially with all of Skulduggery’s dialogue and such. I mean, look at what he did with Tim Burton and as Jack Sparrow! Mr. Landy, if you are reading this and there’s going to be a movie, I would strongly advise hiring Depp as Skulduggery. And if that’s not within your power, pester the moviemakers till they cave in. Trust me. I agree completely. There’s no better man to portray Skulduggery’s character!!!!!!!!! Oh Me!!! !, I’d given you up for dead! I believe Derek said (on facebook, maybe?) that he is no longer talking to Mr Depp. No, just a broken computer! And that’s a pity, but in the end Derek will pick the best man for the job!!!!! Or the film could be a total flop, leaving out all the witty banter from the books (which is one of the best bits), and turning into the next Harry Potter. The movies that is, not the books. The HP books were epic, the movies not so much. I suspect Derek is hoping to have no film just to avoid flopping. I would be like perfect for Valkyrie if they had a movie. I look exactly like she is supposed to look like. LOL!! omg the skullduggery pleasant books are the BEST books ever written i wish i could write like you derek landy you are the best auther in the world i have been trying so hard to draw valkarie and skulldugery butr i just can’t get it….. Does any-one know how i can contact him? Hi my name is Anna I’m 12 tears old i love the skulduggery pleasant books and would love to have a changes to play the part of valkrie Cain if there was to be a movie.I went to small drama school in Droheada co.Louth Ireland I leave there two I started sacred heart school sunnyside Droheada.I was born in Dublin.I follow all thing to do with skulduggery pleasant on Facebook.I love to read and even if I don’t get a changes I wish you all the best with the books. I like am in loveeeeeeee with Skulduggery Pleasant(hes the best detective ever). Love u Derek Landy u write awesome books. Valkyrie Cain love u too. i know , my favourite book is End of the world the 6st book. hi, my name is Stephanie. I am 12 years old and i really want 2 be Valkyrie. i am an aussie so i don’t have irish accents. if any one no any info about the audition, please reply!!!!!!!!! 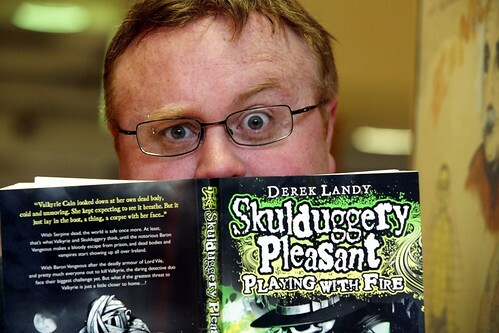 does any one no when derek landy is coming 2 australia? Quick question: Are you going to be bringing auditions to Derby, by any chance? If not, then maybe somewhere closeish because I really, really, REALLY want to have a chance to at least audition to be Val. I just curse my stupid British/American accent, instead of an Irish one! derek wats the 8 th boook is going to be about i cant wait until it comes out and plus i wonde in the world that no body nows that magic is real???? I Met Him In Easons Scotch Hall, He Is Cool! I Really Want To Audition For Valkyrie Cain!!! I Suppose We Could Relate In Some Ways, Haha I Am Really Excited! Hi are there audition for the role of Valkyrie? you know many of my friend keep telling me I should audition for the part of valkyrie cain or tanith low but I don’t know who these charters are when I finaly looked it up some website said the auditions would probably be in dublin I live in washington bellingham even and I’m 16 so I’m to old to be valkyrie it would probably be awsome to audition but some how I doubt I could get to irland I’d rather save my money for a trip with a perpose becouse even if I did go to irland most likely I wouldn’t be able to stay long and you people seem more determend then me you’ve read the book I haven’t so all the luck to you wish I could try but as my mother says all the time when one door closes a better one opens what ever that means .M.X.F. Y’know what? All you suckers are wasting your time. None of you are gonna be Valkyrie. Someone will be; if they ever make a film. Me, I’ll be Tanith. I feel as if her role was made for me. Yeah, hate to break it to you and all that… But its already been cast. Too bad for you. I love your books I started reading them 1 month ago I’m on the 4th book and I want to know will you be having open auditions for Valkyrie in the movie because I live in Ireland and I would love to try impress you with my awesome acting and I’m only 11 but I look older then I am. Just wanted to say how Amazing the books are and that I am such a big fan!! Also.. I am one of the million young girls that would die at the chance to play the part of Valkyrie. I have been acting my whole life, I have long brown hair, brown eyes, I am 13 years old but look 12. I can do a fine Irish accent. I live in Australia, however I will do anything to audition. It is my life’s dream to play this part. So could you please pass this message on to Derek or could someone please let me know when and where the auditions are, it would mean the world! This was published years ago, the movie idea, pah, in your dream perhaps but I’d get over yourselves if I were you! I just wanted to say that i love Derek Landys books and i’ve never found interest in a book except Skulduggery Pleasant. Im 11 years old and started these book when i was 10 and still love them. im on the ninth book and i’m reading Tanith Low in malificent seven. These books have inspired me so much and it even helps me in my work at school. So thank you Derek Landy for making the best books in the world. Glad you like them, Robyn. And as you say, reading is good for you.